A five-member bench of the Appellate Division of Bangladesh's Supreme Court has ruled in favour of holding the Bangladesh Cricket Board elections on the basis of its amended constitution. However, it said the legality of the subsequent elected BCB committee will depend on its final judgment in this case, as a leave to appeal petition has been allowed. 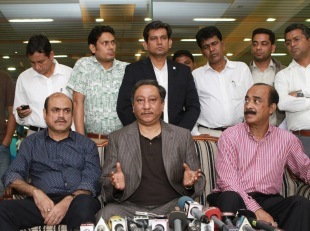 BCB chief Nazmul Hassan said a date for the polls will be discussed at a board meeting on July 29. The court ruling came following a petition filed by the BCB and the National Sports Council (NSC), the country's sports regulatory body, against a High Court verdict that declared the amended BCB constitution illegal on January 27. The High Court had said that the NSC had no authority to amend the constitution of the BCB, following a writ petition filed by Yousuf Jamil Babu, president of Bangladesh District and Divisional Sports Organisers' Association, and Mobasher Hossain, a former BCB director, last December. According to the petition, the NSC had sent an amended constitution to the BCB in November, but as per article 26 of the BCB constitution the NSC had no authority to amend it. However, Article 11.1 states that it has the authority to approve the BCB's proposed amendments. "We can hold elections under this constitution pending the full bench's approval," Hassan said in Mirpur, a few hours after the Supreme Court ruling. "But for now, the elections can be held. It is very good news. We will hold elections as soon as possible, and will start making preparations from the July 29 board meeting." Hassan, however, didn't confirm or deny his participation in the elections, although he was unsure whether he could directly contest the president's post or had to first take part in the normal elections for a director's post. Article 13.2 (a) of the BCB's amended constitution states that "the president must be a board director first". "If there's more than one panel, I will directly contest for the president's election and not join a specific panel as I want to remain neutral. I have to see first whether I have to be a director or directly contest for the president's post. I haven't yet decided to go for elections. You have to understand that I was appointed through a gazette. I have to know what they [those who appointed him BCB president] think." Former BCB president Saber Hossain Chowdhury told several newspapers over the last month or so of his interest in contesting the elections. He was the board chief between 1996 and 2001, when Bangladesh made their World Cup debut and gained ODI and Test status. The president's election was one of four major changes brought to the constitution by the NSC in November last year. They had earlier rejected some controversial amendments adopted in BCB's extraordinary general meeting held on March 1 last year. According to the NSC-amended constitution (based on which the BCB elections will take place), there will be three NSC directors (up from one in the previous constitution); the top six clubs in the Dhaka Premier Division Cricket League (those who qualify to the Super League) will each get two councillorships; that the BCB president will be elected by the 27 BCB directors; the NSC also added a paragraph in the article 9.1 (a) and (b) which reads, "Former cricketers/cricket organisers will get priority while councillors are selected from every regional cricket association, and will be nominated by the president of that district/divisional sports association". The Supreme Court's ruling aided the BCB's ad-hoc committee, which was put in charge on November 27 last year with the specific task to hold elections within three months.